Start a cleaning business of your own. A cleaning business is lucrative and rewarding. Enter a field of unlimited opportunity. As the boss, you set your own financial goals and make your own schedule. You are in control, you are your own boss. Enjoy your workday. Be confident that your cleaning service is in demand and pays you well. Are you looking for expert help to start a cleaning business? Look no further! Hundreds of people like you have used our cleaning service start-up system to get started, and now operate their own successful businesses. With 22 years experience in the cleaning industry we are perfectly positioned to help you start and run your own cleaning business. 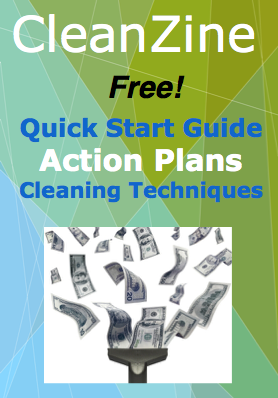 Learn the 4 most important things you need to know before you start your new cleaning business with the Free Quick Start Guide. Sign up now, and get 2 business start-up Action Plans. Follow the Action Plans to immediately plan your new cleaning service. What are the Benefits of Starting a Cleaning Business? To get an idea if the cleaning profession is for you, please read about the benefits of starting your own cleaning business. The Clean Up Now System is the most advanced and complete cleaning business system yet developed for starting and running a cleaning service. Included are over 150 cutting-edge tools and proven tactics to start and grow your cleaning business. Includes a pro-quality business website with social media integration and FREE website hosting!